If you re considering a safari in Africa Zimbabwe deserves to be right near the top of your shortlist. Not only is it home to the magnificent Victoria Falls, one of the Natural Wonders of the World, but is also has some of the most amazing national parks and the best trained guides in Africa. The range of activities available make it an exceptional destination for families. From tracking rhino on foot to white water rafting on the Zambezi, the choice is more than enough to satisfy all ages and all adventure levels. The parks we’ve included in this itinerary – Matobo, Hwange & Zambezi – offer a truly diverse range of landscapes and wildlife viewing options; enabling you to do your game viewing on foot, in 4×4 safari vehicles or by boat. As far as activities go, you can enjoy game walks, cycling through villages and visits to local schools. Other options include a bungee jump from the Victoria Falls Bridge, a scenic helicopter flight over the Falls and a canopy tour in Victoria Falls NP. Matobo NP: rhino tracking on foot, village cycle tour, school visit, game walks, game drives. 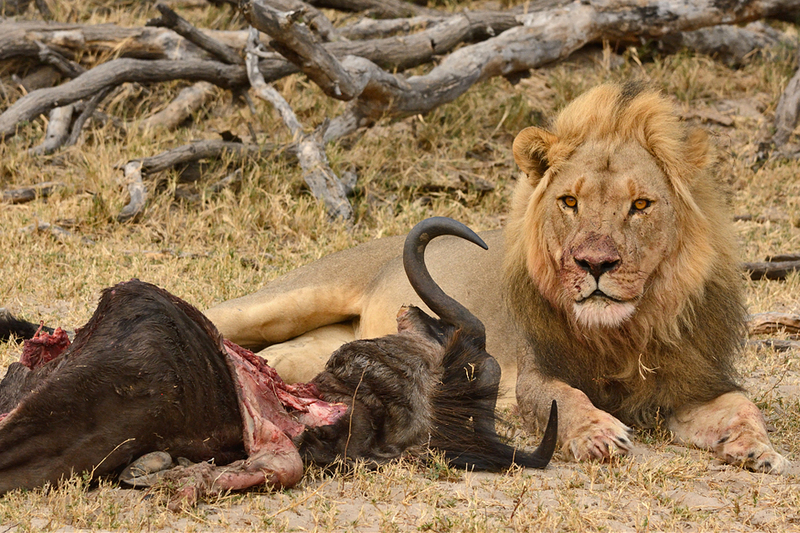 Hwange NP: Game drives, game walks, hide sits. 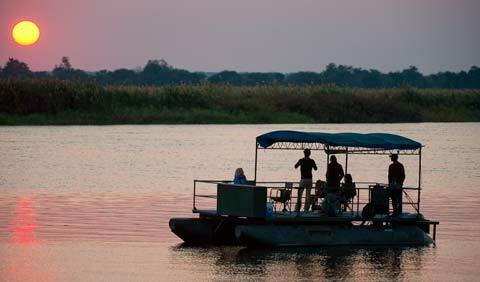 Imbalala: river cruise, Victoria Falls visit, game walks, game drives. Optional river rafting, bungee jump, canopy tour, helicopter flight. Day 1 Bulawayo – Matobo Hills – On arrival in Bulawayo you will be met and transferred to Amalinda Lodge. This exclusive, privately owned safari lodge is located in the UNESCO World Heritage Site of the Matobo Hills, the oldest National Park in Zimbabwe, tucked away into an ancient Bushman’s shelter. The granite domes and castle kopjes echo the essence of tranquility and majesty of untamed Africa, where wildlife and birdlife thrive in prolific numbers. Famous for its healthy population of endangered rhino, the area is one of the most sought after destinations within Zimbabwe. Day 2 & 3 – Matobo National Park is in southwest Zimbabwe. It’s known for the Matobo Hills, a range of balancing rock formations created by erosion of the granite plateau. The walls of Nswatugi Cave feature Stone Age rock art. One of the things we like most about Matobo NP, is that, although it is a National Park, you probably won’t spend a lot of time on game drives. The best way to explore here in on foot, or even by bicycle. The park has significant populations of black eagles and both black and white rhinos and is one of the few places where, accompanied by experienced guides, you can experience the thrill of rhino tracking; both on foot and by vehicle. The Matobo Hills have been important to indigenous tribes for centuries and the granite hills boast many San bushman sites and extensive San rock art. You’ll have the chance to explore these sites for yourself. A well planned cycle route through the villages and rural homes in the Matopos is an opportunity to discover the essence of rural life. Matopos is home to some incredible rural homesteads and their proud residents are excited to extend their hospitality. You can visit a Matabele homestead for an insight into the way of life of the local people. There’s the chance to visit a traditional healer and a local primary school. 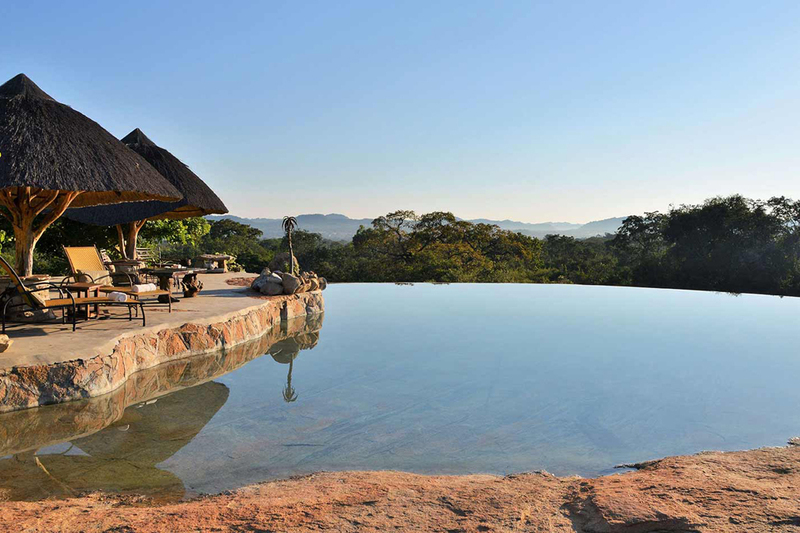 If you need a break from all the action, you could just relax by the wonderful infinity pool and look out over the spectacular Matobo landscapes. Day 4 – After breakfast, depart from Matobo and drive to Hwange National Park. 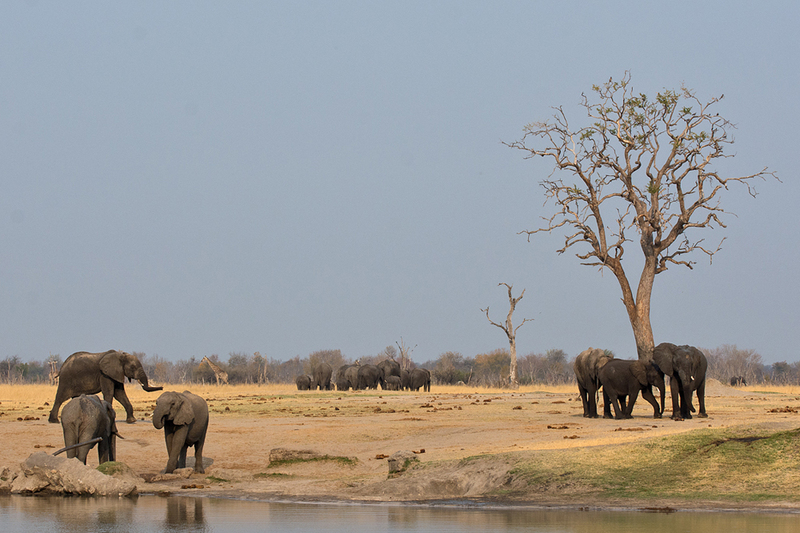 Ivory Lodge, located in the forestry area on the outskirts of Hwange National Park, offers family-friendly safari experiences and is famous for its exhilarating up-close sightings of the Presidential Elephant Herd. The Lodge comprises of a Main Thatched dining and lounge area overlooking a guest swimming pool and overlooking a watering hole which is frequented by elephants, predators and a number of plains game species. 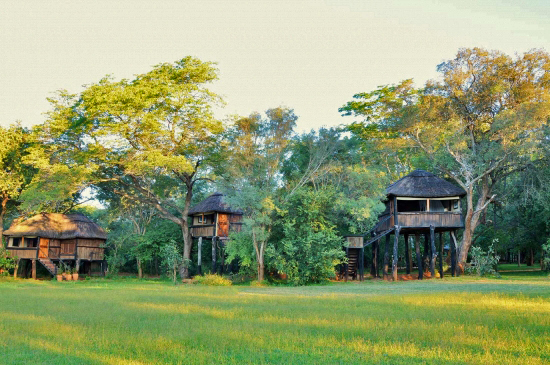 The rooms themselves are elegantly built on stilted wooden platforms offering elevated views of the open floodplain and watering hole in front of camp. Day 5 & 6 Hwange NP – Hwange NP is the largest game reserve in Zimbabwe and is located in the west of the country between Victoria Falls and Bulawayo. Its grasslands and mopane woods are home to large elephant herds, lions, cheetahs and African wild dogs. It became the royal hunting grounds to the Ndebele warrior-king Mzilikazi in the early 19th Century and was set aside as a National Park in 1929. 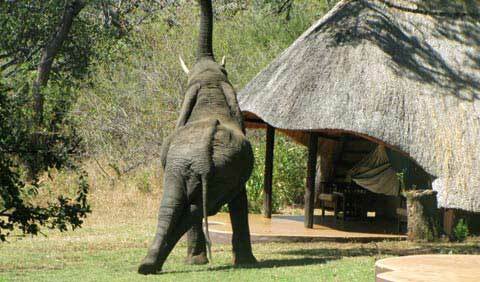 The elephants of Hwange are world famous and the park’s elephant population is one of the largest in the world. There’s plenty to keep you occupied during your stay in Hwange. Game drives in the National Park and also in the private 6000 acre concession will get you close to the herds of elephant and buffalo that roam the park, as well as many species of antelope and the predators that hunt them. 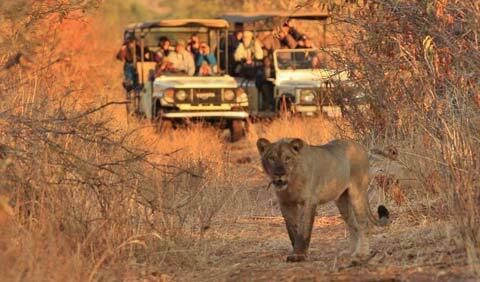 Escorted by highly experienced guides you can take game walks that will give you an entirely different perspective. There’s a big difference between viewing an animal from the comfort of a game vehicle and encountering it whilst on foot. And if you don’t feel like going out an looking for the animals, you could choose to spend time in a specially constructed hide overlooking a waterhole and wait for the animals to come to you. Don’t worry, they will. You won’t go hungry or thirsty either, as there is a waiter service all day. Day 7 Imbabala – Staying at Imbabala Zambezi Safari Lodge is an unspoilt wilderness experience, on the banks of the Zambezi. 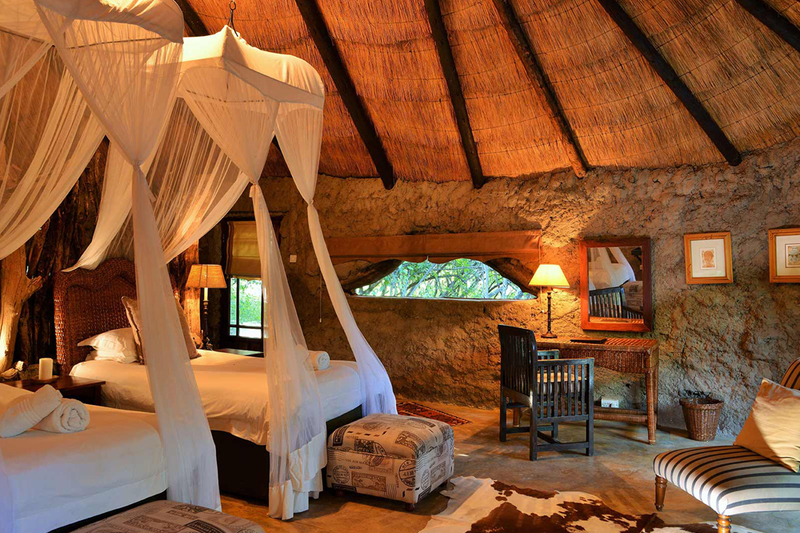 Despite being completely refurbished over the years, Imbabala is still a small unpretentious safari camp offering a true “African Safari Experience”. 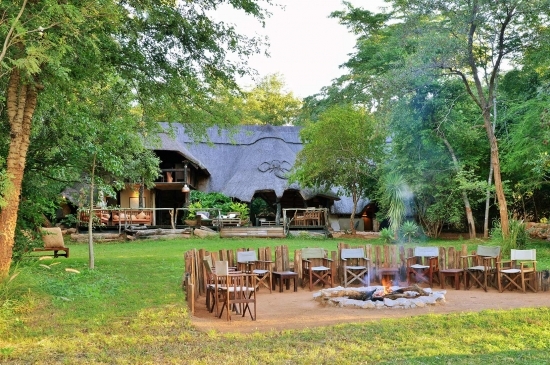 The Imbabala main lodge is a charming thatched structure, consisting of a lounge, dining room and bar area. This offers fantastic views of both the river and a nearby waterhole, which attracts game throughout the year. A swimming pool and al fresco eating area nestle under ancient trees. Imbabala Zambezi Safari Lodge offers exclusive accommodation for only 20 guests in 9 individual stone and thatch lodges with en-suite facilities. Each lodge is beautifully positioned with spacious verandas opening onto sweeping views of the Zambezi River. 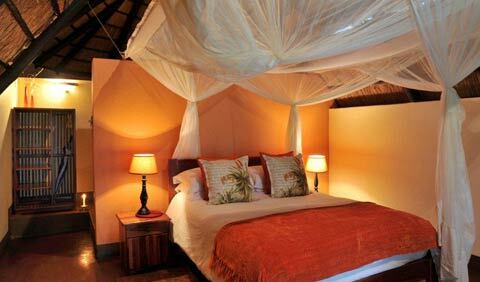 Day 8 & 9 Imbabala Lodge is ideally situated within the National Park and offers guests all-inclusive insight into an exquisite natural world. The activities on offer at Imbalala emphasize the rich natural environment, focusing on the abundance of wildlife that roams through the park and swims in the Zambezi. No need to worry about getting bored here, a bigger worry will be finding time for all the things you want to do; because at Imbabala the list of activities is a long one. Of course there are game drives, but you’ve done that already. The walks at Imbabala usually last for 3 hours and guests will normally walk for about 5km during that time. And there’s more. Your stay includes a tour of Victoria Falls and, if you want it, a full day excursion into Chobe National Park, just across the border in Botswana. If you’ve still got energy to spare why not try the Victoria Falls Canopy Tour; a network of slides, trails and rope bridge walkways within the canopy of the hardwood forest of the Zambezi gorges. You could also go White water rafting, bungee jumping or take a scenic helicopter flight over the falls. Day 10 Your safari ends today. Breakfast will be served in the lodge and then you’ll be transferred to Victoria Falls airport in time to catch your home bound flight. Prices – from £2,100 per person in 2019 for family of 2 adults and 2 children.